George Logothetis: Mikis Theodorakis: the Greek soul, translated from the Greek by Phillipos Chatzopoulos, Agyra editions 2004, ISBN 960-422-095-0. The Chinese version has been published by Shanghai Baijia Publishing House in 2008, ISBN 978-7-80703-861-0. Arja Saijonmaa: En ung naken kvinna : mötet med Mikis (A young naked woman - the meeting with Mikis), ISBN 978-91-642-0345-8 (bound) Stockholm : Piratförlaget, 2011 Swedish 443 pages,  picture pages + 1 CD with four songs by Mikis Theodorakis. ^ Maura Ellyn; Maura McGinnis (1 August 2004). Greece: A Primary Source Cultural Guide. The Rosen Publishing Group. p. 86. ISBN 978-0-8239-3999-2. Retrieved 1 November 2012. 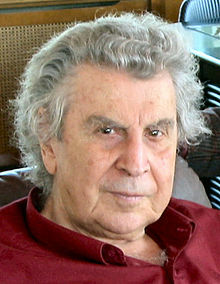 Considered Greece's greatest living composer, Theodorakis has written many scores.